Kenkoku Kinen No Hi (also known as Kenkoku Kinenbi) is celebrated on February 11 and is a national holiday. The purpose of National Foundation day is to celebrate the establishment of the country — it is a patriotic holiday. Subsequent to World War II, Kenkoku Kinen No Hi was abolished, In 1966, law re-established the holiday as it is now celebrated. Early Japanese history books indicate that on this day in the year 660 BC, the first Japanese emperor was crowned. When the holiday was established to commemorate Emperor Jinmu’s taking the throne, it was known as Kigen-setsu. Historians disagree on the details of Emperor Jinmu’s enthronement to this day, but the legend remains part of the holiday. Children’s Day, May 5, was formerly known as Boy’s Festival (Tango no Sekku), however, the name was changed to create a more inclusive holiday. Children’s Day focuses both on the importance of happy, healthy children and the gratitude children feel toward their parents. Despite the name change, the holiday remains largely geared toward celebrating the health and future success of Japanese boys, and Boy’s Festival remains a key focus of the day. Koi-Nobori, or carp streamers, are hung, a symbol of strength against odds, and samurai dolls are displayed as part of the Children’s Day festivities. One koi-nobori, interestingly, is hung for each male child in the family, with the largest streamer being allotted to the oldest child and stepping down in size for subsequent boys. The origin of the Boy’s Festival is uncertain. Some scholars trace it to an ancient Chinese custom called sechie, featuring ceremonial helmets by palace guards, that was popular during the reign of Empress Regnant Suiko (593-629 A.D.). Others believe the Festival originated from the May custom of using banners to scare insects during the growing months. Over time, these banners became more grotesque before taking a turn to become heroic figures that were displayed indoors as symbols of manliness. Still others trace the holiday to Tokimune Hojo’s defeat of the Mongols on May 2, 1282. Finally, others believe the Festival is linked to the unification of Japan by Ashikaga Shogun. What all of these possible origins of the holiday have in common is the emphasis on strength and manliness, and the decorations used in Japanese homes reflects elements of each potential start of the holiday. Items displayed during Boy’s Festival include a miniature helmet, armor, a sword, a bow and arrow, silk banners with the family crest, and warrior dolls (musha-ningyo) representing Kintaro, a famous general, Shoki, an ancient Chinese general who protected people from demons, and Momotaro, who can best be described as the Japanese version of David. In addition to traditional treats like Chimaki (sweet rice dumplings wrapped in iris or bamboo leaves) and Kashiwa-Mochi (rice cakes containing sweet bean paste wrapped in oak leaves), leaves of the Japanese iris (shobu), prized for their resemblance to a sword, are steeped in hot water for bathing (the iris is believed to protect against illness) and mixed with sake to create shobu-sake, an ancient samurai beverage. The Girl’s Festival (Hina Matsuri or Doll Festival) is celebrated on March 3. Between Day, May 4, comes as a result of Japanese law: a day that falls between two national holidays is, by default, a holiday, too. Around here, we like to call this the “Holiday With No Name”. It’s clearly an acknowledgment that people who are taking advantage of the many holidays of Golden Week won’t stop vacationing to return to the office for just one day, and the Japanese name of the holiday translates to “citizens’ day off”. Interestingly, if Between Day falls on a Sunday, the day is not considered a holiday. This is important because if it’s an official holiday, workers are eligible for paid time off. This holiday was established in 1999. Starting in 2007, Greenery Day is moving to May 4, effectively replacing Between Day. But we’re sure the Japanese people will still harbor a fondness for the quirky little holiday with no name. Constitution Day, celebrated on May 3, is a patriotic holiday. The day commemorates the date when the post-war Japanese constitution was enacted. Possibly the most famous part of this constitution is Article 9 which prohibits Japan from participating in war activities, except in cases of self-defense. The Japanese constitution is a point of pride for the citizens of the country. The holiday was established to recognize the 1947 establishment of the constitution. Originally, Greenery Day was the birthday of Emperor Hirohito (or Emperor Showa, the name bestowed after his death), who died in 1989. After his death, the holiday was transformed into a more national celebration of nature. This holiday has been celebrated on April 29 for many years, but in 2007, the holiday will be moved to May 4, the spot currently occupied by Between Day. April 29 will then be known as Showa Day. Greenery Day was established to honor the Emperor’s love for nature, and Japanese people take this day very seriously. Hirohito was a vastly popular leader and was also the author of approximately 14 books on biology. He was the first “human” emperor of Japan, ending the belief that emperors were divine beings. Japan has a reputation for hard work, but let us assure you of one thing: it’s a nation that takes its holidays just as seriously! New Year’s and Obon — the two other biggest holiday events — only manage a single holiday each. Golden Week incorporates 3 (four, if you count “Between Day”) holidays and conveniently timed weekends to make for what can only be described as a mega-holiday. The holidays that make Golden Week golden are Greenery Day (Midori no hi), currently celebrated on April 29 (please note that in 2007, Greenery Day is moving to May 4, but Showa Day will take its place). Constitution Day (Kenpo kinenbi) hits on May 3, followed by the legal holiday Between Day (Kokumin no kyujitsu), and then Children’s Day (Kodomo no hi) on May 5. The rapid succession of holidays means that Golden Week is the perfect time for Japanese families to pack up and travel. It also means that hotels and tourists spots are very crowded. If you’re traveling in the country during Golden Week, make reservations well in advance and expect large numbers of people in popular areas. All train stations and airports are packed — be prepared. The holidays also mean that many businesses close for the celebrations. While this is less of an issue in large cities such as Tokyo, please be aware that shops and restaurants may be closed to allow employees and owners to celebrate the days. Business travelers should plan to avoid Japan during this week altogether. Many local jurisdictions also hold special celebrations during Golden Week. Between Day, May 4, comes as a result of Japanese law: a day that falls between two national holidays is, by default, a holiday, too…. A bean-throwing ceremony to drive away evils during the annual Setsubun festival at Tokyo’s Sensoji Temple. 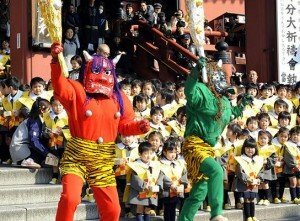 Setsubun means roughly “division of seasons” and is celebrated the day before the first day of spring, according to the Japanese lunar calendar. In 2006, the celebration is on February 3. It marks the first day of the solar year, hence sometimes being referred to as New Year’s Eve. The holiday is associated with purification rites designed to throw the demons out and start the new year fresh and clean. Bad luck and demons (“oni” are expelled through the ritual opening of doors and windows accompanied by tossing beans outside, a ritual known as Mame Maki. This is accompanied by the saying, “Fuku wa uchi! Oni wa soto!” (“fortune in and devils out”); some shout the inverse of this, “Oni wa soto! Fuku wa uchi!” (“devils out, happiness in”). This is a more pleasant approach than the original ritual of burning sardine heads and playing loud drums. Some households do continue to hang fish heads and holly outside to ward off any wandering demons. Roasted soybeans are spread on the cleaned floors inside and are consumed — each person eats the number of beans that corresponds to his or her age. Similar public ceremonies are also held. Another ritual associated with Setsubun involves eating an entire nori maki sushi roll, sometimes while facing a lucky direction. Eating the full roll brings luck, good health, and long life. While dated back to the earliest days of the solar calendar and Chinese custom, Setsubun and its rites were formalized during the Muromachi Period (approximately 1333 – 1592; different sources give different dates). The date falls at the end of Daikan (severe cold) and beginning of Risshun(spring begins). Risshun is the first period of the solar year — the source of the New Year’s Eve concept.